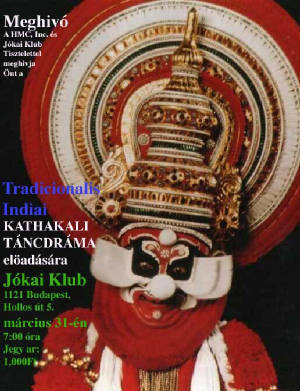 After the spectacular success of the performance at the Jokia Club and Hungarian Museum of Trade and Tourism please come to see this wonderful performance. Kathakali is the classical folk dance-drama of Kerala, South India, which dates from the 17th centuryKalamandalam Ramankutty Nair and is rooted in Hindu mythology. Kathakali has a unique combination of literature, music, painting, acting and dance. In the kerala folk to create makeup for one person, 4-5 hours is needed and two-three people. The ladies portion is done by the gents(man) by dressing like a women, so this time we entertained less ladies. 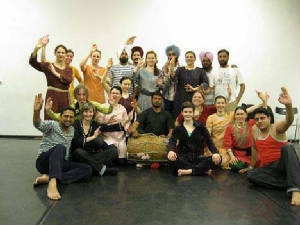 Punjabi folk is dance on the beat of the drum which is enthuciastic traditonal manual music and songs. Kerala Allam osi tancdramaja. 15 eve nem volt Magyarorszagon ilyen eloadas! Tancdrama, Kerala allambol, a muveszek tobb ora alatt keszulnek el a sminkkel es a kosztummel, a noi szerepeket is ferfiak tancoljak. Ösi szovegek szabjak meg a keztartasokat, az arckifejezeseket. Szigoru szabalyrendszeruk van és hosszu evek szigoru es kitarto gyakorlasaval lehet elsajátítani. A kathakali az egyik legnehezebb tanc, mar gyerekkorban kezdik a kepzest. A 16 eve mukodo Hungarian Multicultural Center azok koze a viragzo muveszeti intezmenyek koze tartozik, melyek kulonfele hagyomanyokat es kulturakat mutatnak be. Az ilyen jellegu kozossegek nagyban hozzajarulnak ahhoz, hogy a kulonfele muveszeti trendeket bemutassak es ertelmezzek a nagykozonseg szamara is. A resztvevo muveszek mas orszagok kulturaival talalkozhatnak. Azok a muveszek, akik idejonnek a sajat vilagukat es kifejezoerejuket mutatjak be, mikozben sajat muveszetukre is uj ralatast nyernek. Az Indiai Rajasthani Tánccsoport, olyan tradicionális indiai tánc es zenei eloadast mutat be, mely tajegyseguk hagyomanyait idezi fel es orokiti meg a nagykozonseg szamara. Gazdag zenei eszkozok es jelmezek tarhazat is lathatjuk, melyeket hagyomanyukhoz hiven a muveszek maguk keszitettek. Az eloadas Magyarorszagon eloszor kerul bemutatasra az India Fesztival kereteben, melyet a HMC, Dallas, a Creative Cultural Academy, Ujdelhi, valamint a budapesti Indiai Kovetseg tamogatott. Rajasthan is a vibrant patchwork of rich extensive tradition in art and culture, which reflects Indian way life. Most of the folk art forms and folk dances have been passed down from one generation to the other. Folk arts and folk dances and of course the clothes and dresses worn by the people form an inseparable part of the culture and traditions of Rajasthan. An equally rich and varied folk culture from villages is both fascinating & mesmerizing. Rajasthani cultural tapestry takes in simple folk to highly cultivated classical music and dance in its own distinct style. Over the years settlers in this desert land have added color and brightness to their life with colorful costumes, jewelry, dance and music. They are also a reflection of the indomitable spirit of the Rajasthani’s who have learnt to enjoy themselves even in the harshest of conditions. The state also glows with its historic past of royalty and magnificence. Authentic in origin, essence of Rajasthan, showcases the oldest traditions of the desert life of Rajasthan, fortifying the message of love and friendship through the art of dance and music. The musical instruments of Rajasthan are simple but quite unusual. Handcrafted by the musicians themselves they are rather unique. Autophonic : Ghanta Thali, Ghungroo, Khartaal. String : Sarangi,Ektara, Bhapang, Morchang. Wind : Peli, Algoza, Pauri, Poongi. Womens Attire: Odhni(Head Coth), An odhni is 10 feet long and 5 feet wide, One corner is tucked in the skirt while the other end is taken over the head and right shoulder. Pila/kanchi(Long Blouse), Ghaghra(Skirt), Lahanga(Long Skirt). The Preferred colors are bright red, dazzling yellow, lively green or brillant orange highlighted by a lavish use of sparkling gold and silver zarl or gota. Men Attire: Pagari (turbine) – A special headgear, Angrakha/Achakan as Upper Garment, Dhoti/Pyjama as Lower Garment make up the male outfit. Punjab is very rich in terms of dance. Folk-dances of the Punjab virtually hold a mirror to the characteristic Punjabi manliness, fortitude, forthrightness and gaiety. Folk-dances are not bound by any rigid rule. The dances are down-to-earth and devoid of all superficiality or sophistication. They are an expression of emotions through physical movements. The dancer is free to synchronize any emotion with a gesture that he finds appropriate. The folk dancer does not need any special dress or make-up. The dancers are basically so simple that virtually no preparation is required for them. The folk-dances are secular in character. Members of different sects and creeds, irrespective of their faiths, get together and dance. The main object of the dances are fun and entertainment. The exuberance and vitality of the people of Punjab are vigorously displayed in their folk dances. With the drum beat or to the tune of some other instrument of folk music, the energetic feet of the people of Punjab are spontaneously set in motion to give birth to a folk dance - an expression of the soul triumphant, an outburst of emotions. It’s a dance that cuts across all divisions of class and education and eventually became a part of such diverse occasions as weddings and New Year celebrations.The men and women do not dance together. They form separate groups. Folk dances are generally not the same for men and women but some dances are common to both. Punjab has many types of folkal dances, among them Bhangra and Giddha being the most famous.